GRID Alternatives is a national leader in low-income community solar, as a developer, installation contractor, project and program partner, and policy leader. GRID partners with governments at all levels to develop community solar projects that benefit the highest need community members. GRID is participating actively in regulatory and legislative community solar efforts to increase low-income access in several states. GRID is a partner on the National Community Solar Partnership and the DOE Clean Energy for Low-Income Communities Accelerator. GRID has partnered with utilities to develop low-income community solar projects serving their highest energy-burdened customers. Recent partners include Fort Collins Utilities and Poudre Valley Rural Electric Association. GRID is partnering with multifamily affordable housing providers and public housing authorities like the Denver Housing Authority and the Housing Works in Brooklyn, NY to develop community solar projects that benefit their operations and tenants, including the development of solar workforce training programs. Learn more about bringing solar to your community. 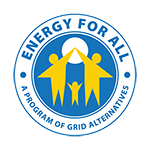 Contact Tom Figel to see what GRID's Energy for All Program can do for you.